Toop&Toop Blog: Headlines... Job losses. What now? Headlines... Job losses. What now? Well, we are hiring! Team Toop is ready to step up and do our bit! Doom and gloom can easily take hold if we let it. Holden has dominated the headlines all week. On Wednesday morning, Dan Akerson, President of General Motors in the USA was being quoted as having "1,760 jobs in his hands". The future of Holden lied solely with Mr Akerson's decision. By Wednesday afternoon, the city was abuzz with the news that 'It's official—Holden are out in 2017'. For me, I like certainty and with the announcement we now know what we are dealing with—thank goodness. We have time to adjust and get our collective act together, and to take up the challenge. Real estate in the Northern suburbs will have uncertainty, but prices are not high and the market has already factored uncertainty in, so it is not a huge surprise. It will be interesting to see now what the 'Pollies' have to say, and this sure will test their leadership leading into the State election. It is perfect timing for an election as we will see what they are made of—have they got what it takes to lead this State? It will become a lot clearer. Rather than South Australia standing back and being victims, I say it's time for us to stand up and take control. Let's start with South Australia's business owners making a stand and doing whatever we can to innovate, be bold and get some jobs going. GOVERNMENT. They have shown they are struggling to fix the big issues, giving lots of promises over the past decade, but all we seem to get are more hurdles. Maybe they can help in another way. I think it's time the Government simply got out of the way of small business and cut up red tape. Politicians, you have created so many new laws in real estate and the building industries that we are drowning in it. It hasn't really made a scrap of difference from 30 years ago when I first started in real estate. You will always have good and bad operators, no matter how many laws are passed! So many new impediments to free flowing business—it is all quite insane. Government, get out of the way and let small business owners get on with what we are meant to be doing—making money and employing more people. Get rid of Payroll Tax (such a ridiculous tax when we are creating jobs). Get rid of administration burdens like BAS, compulsory surveys such as those from the ABS and all the new bureaucratic legislation. Let small businesses get on with things and start employing again. As I mentioned three weeks ago, Toop&Toop will be doing our small part. 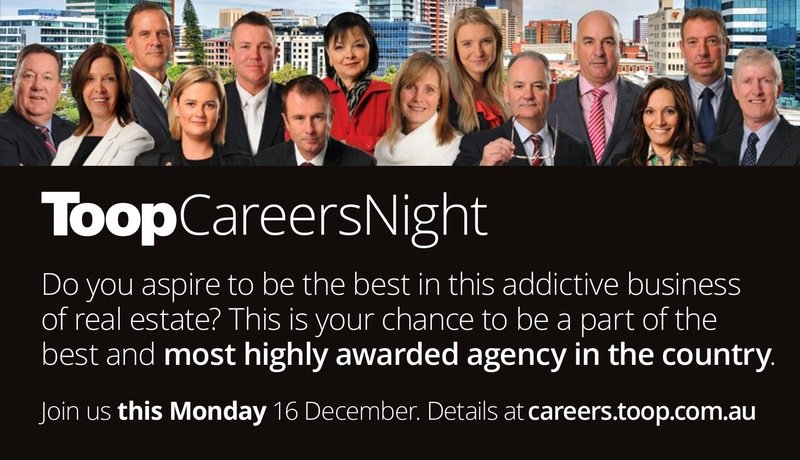 We are looking for up to 10 new team members, all who are passionate, smart and enthusiastic people. We are ready to step up the service we can deliver to our clients, and we need more awesome people in order to do it. New additional jobs include Property Management, Sales, Admin and IT Software programming. Send your resumés in now. 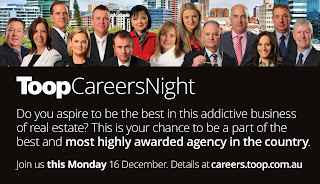 Monday night: We are holding a Toop&Toop careers night on Monday 16 December 2013, so if you are a gun and want to have a career (as opposed to just a job), email Sarah Williams at sarah.williams@toop.com.au, or call 08 8366 0856. South Australia is amazing, no better place in the world to live, and if it is to be, it is up to us.